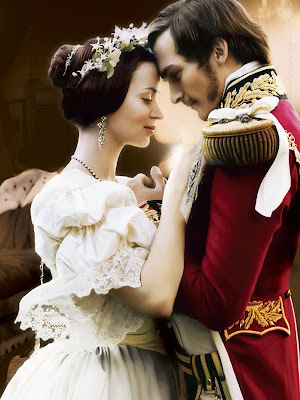 From the Oscar-winning producing team of Martin Scorsese and Graham King (The Departed) comes the soaring drama The Young Victoria which chronicles Queen Victoria's ascension to the throne, focusing on the early turbulent years of her reign and her legendary romance and marriage to Prince Albert. 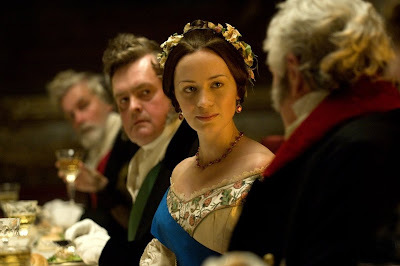 The film is set in the period from 1836, the year before Victoria ascended the throne, to 1840 the year she married Prince Albert and sets out to revise the widely held picture of Queen Victoria as an elderly widow dressed in black. "The Queen Victoria everyone knows is the older Widow of Windsor with the handkerchief on her head, a rather fat woman in black looking depressed. Very few people know about the other side of her, her early life: that she was young, that she loved dancing, that she loved music and that she was very romantic. Some girls like to have fun and she was certainly one of them,” explains Fellowes. “But the extraordinary story at the beginning of her reign is how everyone tries to control her. I was convinced we should begin the film before her succession and her marriage to Albert. That way you can see her struggle with her mother, the Duchess of Kent, who tried to devise a role for herself so she could get more control. The business of instant celebrity is also interesting," Fellowes continues. "One minute Victoria was living under virtual house arrest, the next she was the most famous woman in the world." At the heart of the film is the love story of Victoria and Albert, who she married in 1840. This happy and fulfilled chapter is the focus of the film. "Prince Albert was purposefully chosen for Victoria over his less attractive older brother, by his uncle King Leopold of Belgium,” explains Fellowes. “Leopold was using Albert to jostle for power and influence over the British throne and considered him ideal for a woman who was determined to marry for love. What is interesting is that Albert fell for her completely. He came from a very dour German court and suddenly he was with this girl who was out for a good time. She loved dancing, music, riding. Everyone had overlooked the possibility that they would fall in love with each other." What appealed to producer Graham King about the story was the romance. "It is a pure love story to me. It is a human story, a story that people can relate to rather than just being a standard period film or film about royalty. I didn't want it to be a conventional period film, but something a bit hipper and a bit edgier." Starring Emily Blunt, Rupert Friend, Paul Bettany, Miranda Richardson, Jim Broadbent and Mark Strong, “The Young Victoria” will be shown exclusively at Greenbelt 3 starting Sept. 30.